On Friday, 30th March we went to Kraslava State gymnasium. 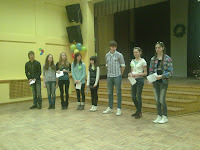 It was dedicated to European foreign languages.There were participants from four Secondary schools of Kraslava region. 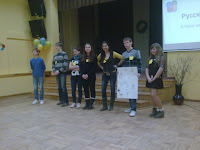 Firstly,we made the presentation about our school, class and ourselves.Secondly, we were in different working groups and learnt new languages. Valerija was in the group learning the first steps in German.Roksana showed her best in Russian.Santa was in a Swedish group and Oleg mastered English phrases –a group of words which are often used together and have a particular meaning.Anna learnt some Spanish numbers and everyday phrases. We sang songs in European languages. Together with children from Indra Secondary School we played a game’’Hip-Hap-Hop’’. It was a great fun. It was a gripping event.There were a lot of fun things to do there.